Islam is the majority religion in Indonesia. More than 70% of Indonesia’s population is Islamic. 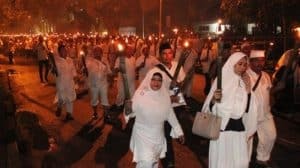 For this reason, it is not surprising that the Islamic New Year in Indonesia is celebrated with a variety of different activities and traditions. The Islamic New Year which falls in the month of Muharam also coincides with the beginning of the Javanese calendar, which starts from the month of Suro. One Muharam or Suro which has a record of important events in the Islamic world or Javanese culture has become the backdrop for the emergence of various festivals or celebrations to commemorate it. The celebration of Islamic New Year is also held in several regions in Indonesia with quite unique. Here are some traditions of Islamic New Year in Indonesia. Nganggung, is a tradition of community mutual cooperation in the City of Pangkalpinang by bringing a complete meal on a brass tray covered with a serving hood. Each door of the house (family) carries a tray made of Brass, containing food according to the family’s status and abilities. The Nganggung tradition is often also called the Sepintu Sedulang custom. This tradition is usually carried out during religious ceremonies, such as Eid al-Fitr and Eid al-Adha, Mauludan, Nisfu Sya’ban, and Muharam activities. 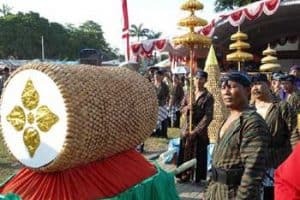 The Bengkulu community celebrated the Hijri New Year by holding a Tabot festival from the 1st to 10th of Muharram, which was to parade a giant object named Tabot around the village. This celebration was also held to commemorate the death of the grandson of Prophet Muhammad SAW named Hussein in Karbala, Iraq. The Tabot Festival was first held in 1685 by Syeh Burhanuddin, also known as Imam Senggolo. 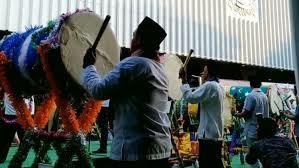 The Tabot Festival in Bengkulu has ritual and non-ritual aspects. The ritual Tabot festival can only be done for those who are descendants of Tabot, while the non-ritual Tabot festival can be followed by anyone. The show is in the form of dancing, tambourine and hitting drums. There is a unique tradition of Makassar residents welcoming the changing years of Islam or Hijriyah. Every 1st of Muharram, housewives invade shops or markets that sell household supplies, to shop. Household furniture purchased is usually in the form of containers, such as pots, basins and pans. That means as an expectation to catch good things in the new year, which will be lived in the next year. I do not know what lies behind the tradition, but certainly this tradition has been carried out for generations. The furniture they usually buy is always related to water places, such as buckets, dipper and water kettle. Every 1st Muharram Keraton Surakarta holds a tradition of parading the Kebo Bule which is actually an albino buffalo surrounding the city of Surakarta. The buffalo (kebo) which is considered sacred in this tradition is believed to be the favorite animal of Paku Buwono II according to the book Babad Solo by Raden Mas (RM) Said. 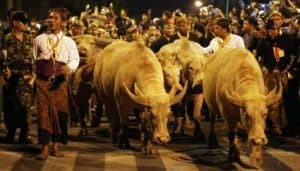 The most highlighted in this tradition is when people fight over each other to be able to touch the buffalo being paraded and look for feces that are believed to bring blessings to those who managed to get it. For the Javanese there is one tradition or habit in welcoming the Islamic new year, It is named ‘ngumbah’ keris or washing the keris. This activity can only be done in the holy months and is considered sacred. Where in the month of Suro this is considered a sacred month which can add supernatural power to the keris or Kris. Before washing the heirloom, you must do a Puasa pati geni in a closed room one day and one night. Then before night 1 of Suro, immersion is done using special ingredients to remove rust. It is aimed to keep the prestige (style) of the kris back to appear. The tradition of ngumbah keris has indeed caused a lot of controversy. The tradition of mubeng beteng is the tradition of surrounding the fort (mubeng beteng) which is held every 1 Muharram in the Ngayogyakarta Hadiningrat Palace and attended by all residents. When carrying out this tradition the citizens and servants of the palace will surround the fortresses with an odd number of counts and walk barefoot and not make a sound (Tapa Bisu). The meaning of the tradition of mengeng beteng itself is a form of concern, introspection and gratitude to God Almighty. Ledug Suro was held for one week before the Javanese New Year and Islamic New Year, with various activities such as the Bedhug Lesung competition followed by each sub-district and service / agency and other activities such as the Suro market, and various folk entertainments such as traditional dance jalak lawu, drumband, wayang kulit, Reog and others. 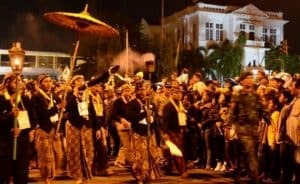 In the Ledug Suro procession, end with a chopper or bring bolu bread in the form of mortar and bedhug in the middle of Magetan city. 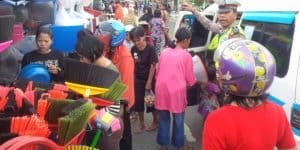 The Ledug Suro program was carried out as a thanksgiving to God for the blessings and fortune that had been given to the people of Magetan. 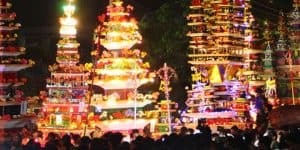 There is still a unique tradition that is maintained and still preserved by the Javanese Indigenous people, when welcoming the New Year of Hijrah or the Javanese year of the Suro One. As done by the villagers of Gerit Dukuh Kepoh, Cluwak District, Pati. 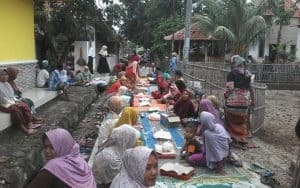 Every afternoon at the beginning of the New Year’s Hijri or the Suro One in Java, the community of the Kepoh in Gerit village gathers at the village road intersection with Nasi Urap and side dish to feast together and pray to welcome the Islamic New Year. With banana leaves, about a hundred rice mountains that are brought by the residents are collected and then prayed for in the blessing of this Hijri New Year. 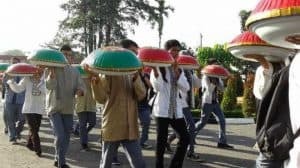 In Sukabumi the community and citizens celebrate the new year of Hiriyah by participating in a race to beat the drum called ngadulag. Contestants are usually in the form of groups of three or more people and have duties as drum beaters, clappers and other additional beaters. It is really unique and truly still conserved till today. The rhythm played by the contestants always amazed the audience because they could display something unique. On the 1st of Muharram the people of Aceh will perform various rituals which aim to commemorate the death of the grandson of Prophet Muhammad SAW named Hussein at Karbala that same month. During the celebration they did not forget to provide special food in the form of khanji acura porridge made from a mixture of rice, coconut milk, sugar, coconut slices, beans and fruits such as papaya, pomegranate, banana, sugar cane and tubers. After reading those traditions, now you understand that Indonesia has various celebration of New Year. Besides celebration of Islamic New Year, there is also a celebration of Chinese New Year. With the common New Year, so Indonesia celebrates 3 New Years in a year. What a really nice country!